Playmates will continue to produce Teenage Mutant Ninja Turtles toys after the Turtles were bought up by Nickelodeon. 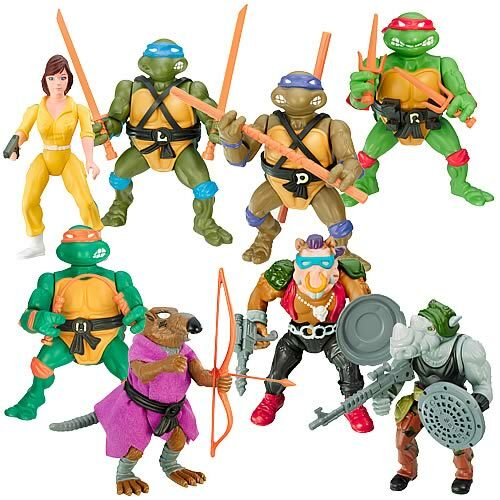 “Playmates Toys will continue as global master toy licensee for the Teenage Mutant Ninja Turtles under the property’s new controller, Nickelodeon & Viacom Consumer Products, the toymaker said today. The long-term partnership allows Playmates Toys to continue its 20-year history with the Turtles brand. The alliance also lets Playmates “execute on its strategy to maximize global toy rights in partnership with renowned brands that leverage entertainment across multiple-media platforms worldwide,” the company said. This is awful news for any chance of seeing another release of the NECA turtles or even Series 2. They probably still have the rights, but they'll only ever be able to sell them to collectors. I want those and the 2003 turtles. I really would like to see some super articulated 3 3/4, or 4" turtles. If they were to have ball joint head, hips, shoulders, elbows, swivel wrists and waist , hinged knees I would buy 2 sets IMMEADIATELY. One to open, one to save forever. And if they made comic and TV versions I would buy BOTH. Just think about it... 3 3/4 foot soldiers? hundreds of them, and finally a Shredder at the top fighting it out with Storm Shadow and Snake Eyes. MUAH HAHAHAHA. You can have the Turtles being backed up by Captain America and Duke!! !